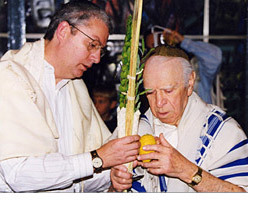 Jewish religious observance is an important aspect of life at Daughters of Miriam Center/The Gallen Institute. 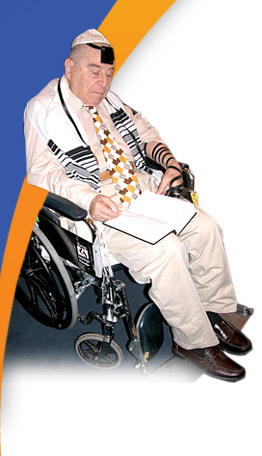 A full-time Rabbi conducts pastoral visitations for long-term care residents and apartment tenants and serves as the masgiach for the glatt kosher kitchen. Services are held daily in the beautiful Garfinkle Chapel which was renovated to meet the needs of our elderly residents. No detail was missed in creating a place of beauty that graciously accommodates the needs of the elderly resident, whether they are wheelchair bound or visually impaired. A reconfiguration of the bimah allows for wheelchair accessibility while a two-level reader’s table with handrails and an enhanced lighting system enables residents to easily participate in services. 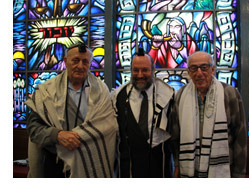 Upon entering the Chapel, residents can touch one of two mezuzahs, one at the traditional height on the entrance door or a second one which is positioned lower and is easily reached from a wheelchair. High Holiday services are held in the Marcus Auditorium to accommodate the overflow crowd. Families, as well as the surrounding community, are encouraged to participate in services and religious observances, including the Passover Seder and holiday parties. Local day schools visit on a regular basis, making special trips to help celebrate the holidays with the residents. On Purim, children visit in costume to hand out shalach manot. During Passover, a model matzoh bakery is held in the auditorium while local yeshivas perform model seders with residents, sharing traditions and memories of the holiday. A model shofar factory is part of the high holy day celebrations. In addition, residents and their families can enjoy the fall weather and sweet treats in the three sukkahs in the Daughters of Miriam Center and Miriam Apartments gardens. 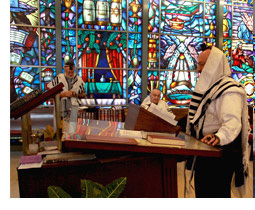 For people of other faiths, arrangements are made to meet with clergy of their choice. Mass is held monthly and on holidays in the auditorium. The director of religious services works with area clergy to insure that the spiritual needs of all residents are met. For more information, contact the director of religious services by clicking on the link or by calling 973-253-5308.